Since its inception, Scrabble has been marketed and popularized as a word game. 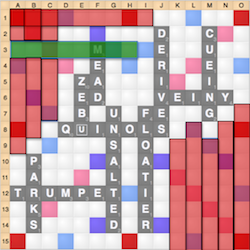 In Scrabble, the goal is to form words by anagramming: unscrambling the tiles in your rack to form valid words both in your rack or on the board. Scrabble is largely accepted by most players as being the more popular word game around the world. This is certainly the case for Scrabble when most of us are playing Scrabble with our friends and family. 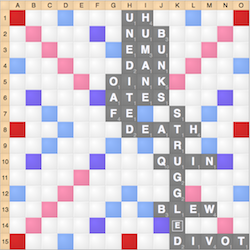 However, tournament players have a very different view of Scrabble. They don’t see Scrabble as just a word game, but also as a board game. 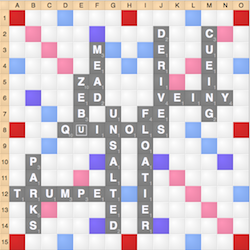 For tournament players, manipulating the board to limit their opponents’ ability to score is a fundamental goal in Scrabble. One of the primary goals of tournament players is to play a bingo: a play that uses all 7 tiles in your rack and nets you a 50 point bonus. Top players average 2 or more bingos per game, thus receiving 100 or more extra points a game. These extra points often tip the scales: the person with the most bingos will usually win. As a result, when one player gets a lead, one of their primary goals is to prevent their opponent from playing a bingo by trying to shape the board so it is difficult to play a bingo. Without one, it will be very difficult for the trailing player to come from behind and win the game. How do they do this, you might ask? There are two primary methods of blocking the board. The first is a method called restriction. Restriction requires creating a wall of words that are difficult to play through, thus making a region of the board inaccessible to both players. This process essentially shrinks the board, and thereby makes it difficult for either player to play a bingo. This is a huge advantage to the player who is leading. An example of a restricted board. Dark squares in the right diagram indicate squares that are extremely difficult to access. As you can see, there is essentially a wall blocking the left side of the board. Even if you do manage to access some of these dark squares, your troubles are not over, as your opponent can often just simply block the board again. 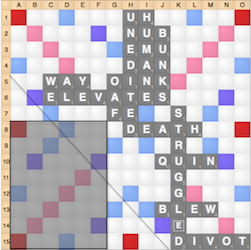 For example, in the following diagram, if one player plays ELEVATES (6c, 19 points), your opponent can still easily block the board while often scoring even more points than your board opening play. An example of trying to open a restricted board. 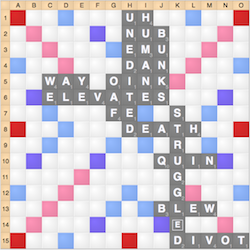 In this case the opponent responds to ELEVATES (6c, 19) with WAY (5c, 35), which outscores ELEVATES and keeps the bottom left of the board restricted. 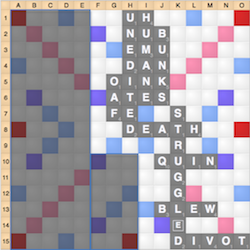 Meanwhile, the top left of the board is cluttered: the net result is a board that isn’t much better for bingos at all. The second method of blocking the board is called exhaustion. While restriction seeks to block off certain parts of the board, exhaustion seeks to populate every portion of the board with so many tiles that there is no longer enough open space available to play a bingo. Exhaustion swarms the board with tiles such that playing 7 or 8 letter words becomes difficult and infeasible. An example of an exhausted board. Open bingo lines are highlighted in green, while open space for potential bingo lines (that can’t be currently used) is highlighted in red. While there are few bingo lines open now, what’s even more alarming for a trailing player is the low number of potential bingo lines on future turns. Even if you try to access the open squares on the board, often your opponent will simply block those lines, often exhausting even more bingo lines, quickly populating the open board space until there is no place left to bingo. An example of an attempt to open the board by playing TRUMPET (12a, 24), only for your opponent to play PARKS (b10, 34), closing one of the remaining open bingo lines and reducing the number of potential bingo lines. 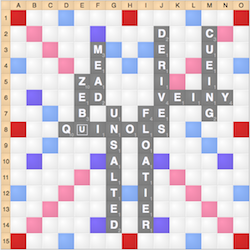 These are just some of the many techniques that are involved in tournament Scrabble. 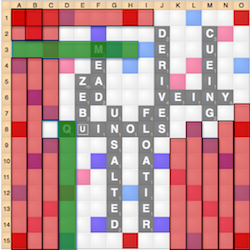 While Scrabble is known as a word game, it’s more than that: it’s also a board game.